President Emmerson Mnangagwa selected his Cabinet based on performance, and will not hesitate to crack the whip to ensure project implementation, a senior Government official has said. In an interview with The Sunday Mail last week, Presidential spokesperson Mr George Charamba said Cabinet was primed to rapidly implement star initiatives in terms of a goal-getting matrix. He underscored that “politics of faces” does not determine ministerial performance, adding that “the inertia that had developed in Government” will be broken. “You are going to see a lot of cracking of whip. This inertia that we had developed in Government is going to be broken. We have a propensity to read the politics of faces rather than the execution of value which some faces do have. “It tells that we are moving in a direction where we are ‘projectivising’ development. You will hear less and less of ministries and more and more of cross-ministry collaboration around flagship projects. Mr Charamba said President Mnangagwa had taken into account his appointees’ high-performance records before deploying them to respective portfolios. He said, “For the purposes of viability of the nation State, you must strike a very healthy balance between politics and the trade. For example, the new nomenclature for what used to be the Ministry of Foreign Affairs is now Foreign Affairs and International trade. “This restores that balance between the political and the economic. Ultimately, nations do act in pursuit of their economic interests because at the heart of good politics is economics. You will also note that the incumbent minister for that ministry has a proven record from his previous office. “Air Marshal Perrance Shiri has been driving Command Agriculture. It’s not like he is coming from the barracks into the cornfields. He had long left the barracks for the cornfield. His appointment is consistent with the phrase ‘hitting the ground running’. Last Thursday, President Mnangagwa unveiled a Cabinet largely comprising experience and professionals. First-time appointees include Air Marshal Perrance Shiri (Lands, Agriculture and Rural Resettlement), Mr Winston Chitando (Mines and Mining Development), Cde Petronella Kagonye (Labour and Social Welfare), Major-General (Retired) Sibusiso Moyo (Foreign Affairs and International Trade), Professor Amon Murwira (Higher Education, Science and Technology Development), Professor Paul Mavima (Primary and Secondary Education), Cde Ziyambi Ziyambi (Justice, Legal and Parliamentary Affairs) and Cde Kazembe Kazembe (Sport, Arts and Recreation). Air Marshal Shiri, a holder of a Master of Science degree in Development Studies, helped steer the Specialised Maize Production and Import Substitution Programme or Command Agriculture as chair of its technical committee. He has been one of Zimbabwe’s top farmers for years running. Rtd Maj-Gen Moyo holds a PhD in International Relations from the University of Zimbabwe. Regarded as one of the best minds in the Zimbabwe Defence Forces, he is highly experienced in global diplomacy. Prof Murirwa holds a Bachelor of Arts (Honours) degree in Geography, a Master of Science degree in Environmental Systems Analysis and Monitoring and a PhD in Geo-Information Science (GIS, RS) for Environmental Systems Analysis and Monitoring. He sits on several science-related boards and is a highly-respected ecologist. Prof Mavima is an accomplished academic and certified financial planner. He enrolled for a Bachelor of Science in Political and Administrative Studies at the University of Zimbabwe in 1984 before completing a Master of Public Administration programme with the same institution in 1990. He completed doctoral studies in the United States in 1999, and joined Grand Valley State University in Michigan as an Assistant Professor in . He relocated to Zimbabwe in 2008, later joining the Civil Service as Principal Director in the Office of then Deputy Prime Minister Arthur Mutambara. He was elected National Assembly representative for Gokwe-Sengwa in 2013. Mr Chitando joined Hwange Colliery Company in 1985, and worked for Anglo-American Corporation in various capacities, including Chief Accountant, for 11 years. In 1997, he became commercial manager (Mining and Industrial Division) at Zimasco before rising to the position of executive director (finance) for both Zimasco (Pvt) (Ltd) and Mimosa Mining Company (1998-2007). 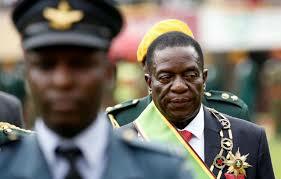 He served as Vice-President of the Chamber of Mines of Zimbabwe from 2008 to 2011 and its President from 2011 to 2013. He had been chairman of Hwange Colliery Company Limited since May 19, 2016, and executive chairman of Mimosa Holdings since April 1, 2013. Cde Kazembe holds a Master of Business Administration degree, and is reading towards a PhD in Informatics and Design (ICT). A chartered engineer, he represents Mazowe West in the National Assembly and once served as secretary-general of football giants Dynamos.